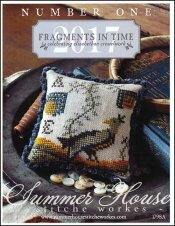 Fragments In Time 2017 Part 1 [W6728] - $5.00 : Yarn Tree, Your wholesale source for cross stitch supplies. Cross stitch pattern from Summer House Stitche Workes. Chirp, chirp, chirp. Standing next to a blooming flower, a visitor has landed. With his distinguished coloring, he stands with his head turned behind him, looking into the distance. What do you think he might see? Stitch count is 49W x 50H. Stitched on #5027 Zweigart Belfast Linen 32ct. Platinum. Chenille Trim: #2287 Thunder Cloud Cotton Chenille from Lady Dot Creates.